Do you know the absolute best way to guarantee you’ll see deer from your bow hunting tree stands this fall? Alright, we don’t either. If someone knew that, they sure aren’t sharing it with anyone. But there is one method you can rely upon to increase the attraction of your hunting area, particularly as it applies to bow hunting deer. The simple trick is to set your deer stands in strategic places near hunting food plots, or plant these hunting plots near a great tree stand. Fall is on its way, now is the time to follow these steps on how to plant fall food plots and hunting plots. That sounds simple enough. So where do most hunters go wrong? There are usually two culprits for this problem. One, the food plots or corn/bean fields are usually too big or too exposed to really hunt effectively without spooking game animals (especially whitetails) from them routinely. The second issue is that tree stands are often hung in places that might offer great shots, but they can’t be accessed without alerting deer to your entry and exits. This is pretty much a no-win scenario for eager bow hunters. Let’s look at the right way to use food plots for bow hunting deer below. What is a Hunting Plot? A hunting food plot is different than a large agricultural food plot in a few ways. Hunting plots are small in size (i.e., less than ½ acre) to make sure you can kill a deer from anywhere within them. Your deer hunting stand locations should be in strategic places that work well for ambushing animals. And they should usually be planted in highly attractive food plot species, such as brassicas, peas, annual clovers, or cereal grains. This combination makes them perfect for bow hunting deer. Size is important for these plots, as anything over ½ acre really limits your ability to shoot across them with a bow, unless your food plot is a narrow and winding lane. Their small size also means that you should be able to sneak into and out of your tree stands for bow hunting, since the chance of running into a deer is slim in a smaller area. One way to further sweeten a plot is to add a mineral site nearby. They should be tucked into tight cover to allow you to stealthily approach and stay concealed while in your hunting tree stands. Last, the species you plant are important. For hunting plots, you want your plot to be the most palatable and attractive food option in the neighborhood when archery season opens. That means quick-growing (usually annuals), highly digestible, protein- and carbohydrate-packed species like those listed above. Now that we’ve defined what it is you should aim for, let’s talk about how to make a food plot. First, you’ll need to find a spot like we described above. It could be a small woodland opening, an old trail, or a brushy corner of a larger agricultural field. Whatever works for your plan of attack. Then you’ll need to clear the existing vegetation using chainsaws, brush saws, mowers, weed-whippers, and/or herbicide. Make sure to leave a fringe of cover around the edges, if possible, and definitely don’t remove potential trees for bow hunting deer out of! After you clear the area, you have a few options. Depending on how much soil is exposed, you could simply rake the area clean of leaves and debris, burn the residue off, or simply disc everything under (a garden rototiller works fine for such small plots). Once the soil is exposed, you could test it using a soil testing kit from the store to be most accurate. Or for these small plots, you could just wing it. It will almost certainly need some lime or calcium spray to raise the pH of the soil, and you should also scatter a couple 50 pound bags of general 10-10-10 or 13-13-13 fertilizer to raise the nutrient level. Then the really fun part begins. Whether you plant the species we mentioned above or do your own homemade food plot mix, it’s important to consider when to plant food plots. If the archery season opens in late September, but you don’t plan to be bow hunting deer until mid-October, time your planting to be at peak attraction when you’ll physically be out in the woods. How? Look at the days to peak maturity on the seed you’re planting, and count back from the day you’ll start hunting. That will give you the earliest time you should plant your hunting plot. You can plant them a little later than this date too, as young plants are very attractive, but the plots may be over-browsed quickly due to their size. 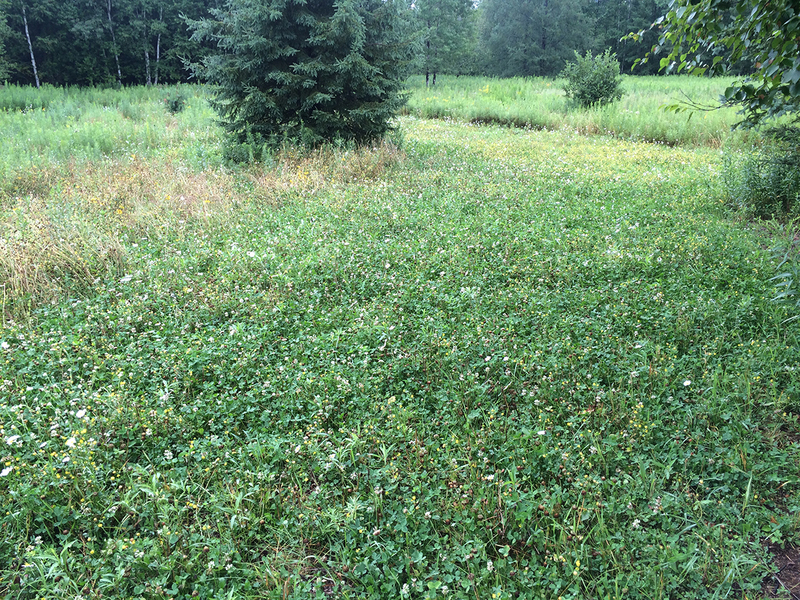 Using this strategy, you can really produce some quick and easy food plots for hunting. Where to Hang Your Best Bow Hunting Stands? 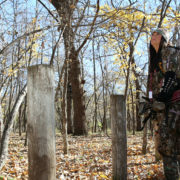 Now the third piece of the hunting plot puzzle; where should you set up your bow hunting deer stands? If you planned the shape right, there should be a suitable tree standing in heavy cover within 10 yards of the edge of the plot. You don’t want it right on the edge so that it completely sticks out, and that’s also where the heavy cover comes into play for camouflage purposes. You’ll want to be able to sneak into the plot quietly using a cleared access trail, and then silently climb into your stand to hunt mornings and evenings. The Muddy Outdoors Sportsman lock on stand is perfect for this setup. Then in the early afternoon hours of your first hunt, you can hang the Sportsman tree stand and get comfortable. The seat flips back so you have full use of the platform to have a steady bow stance. While there’s no way to absolutely guarantee you’ll get a Pope and Young buck while bow hunting deer in these plots, using this method will substantially raise your hunting effectiveness. And that’s at least something to celebrate.